These are the guidelines for the Inspired Bloggers Network Facebook group. The purpose of ‪#‎InspiredBN‬ is the encouragement and education of bloggers. Our Facebook group is for education and encouragement ONLY. You can only use our group for asking/answering questions and seeking encouragement. All other forms of promotion should be posted in InspiredBN Promos ! Link Ups ! and More ! Those interested in a Pinterest community can request to be added to InspiredBN Re-Pin Me. If you are a business owner, all advertising must be approved by admin and provide a beneficial relationship for our members. Please contact Tabitha Philen before soliciting members for a campaign. *When posting a question or answering a question, you can tag your blog’s Facebook page like a signature to your question/answer. If you do not know how to do this, you simply use the @ symbol, and then without a space, start typing the name of your Facebook page. Do not place your entire URL there. Only a tag. And, please only tag YOUR OWN blog’s page and not someone else’s page or your personal page. *Links about blogging/social media tips – UNLESS you are the author of the blog post. Remember, no self-promotion. But, the group is not for generating blog traffic like some groups are. You can pretty much guarantee that your post will be deleted if: 1) it is a link that has nothing to do with blogging, 2) you have scheduled a link through hoot suite, 3) you use an affiliate or referral link in the status, 4) it is an attempt to stir up controversy, or 5) it is bashing another person, religion, nationality, etc. If you have a problem with someone in our group, please attempt to settle it outside of the group. Any open arguments will result in BOTH parties being removed. The Inspired Bloggers Network Facebook group is not exclusive to Christians (although the majority of us are), but there will not be any prejudice against any religion, nationality, race, relationship status, blog niche, favorite color, or choice of pet. Your participation in our group means you accept these terms (whether you have read them or not) and agree to abide therein. Tabitha Philen, Inspired Bloggers Network, Inspired Bloggers University, Philen Multimedia, and its agents assume ABSOLUTELY NO responsibility, including but not limited to injury or loss of any kind/form due to the use of information, or participating in activities and conversations found in this group. By becoming the member/participant of the Inspired Bloggers Network Promos, Link Ups, and More Group, you agree to the terms and conditions of the group. Thank you for joining the Inspired Bloggers Network. Your subscription is NOT complete. 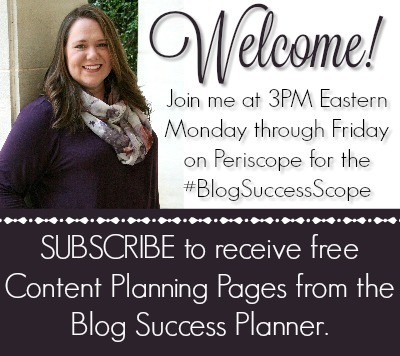 Please check your email to confirm your subscription and to get your Blog Success Content Planning Pages. I'd like to receive the free "How to Make Money Blogging" email course.